Much of Oregon’s municipal water originates in forested watersheds, including those managed for wood production. As rain or snowmelt soaks into healthy forest soils, it is naturally filtered and over time is released to nearby streams or groundwater aquifers. To protect fish and safeguard drinking water sources, Oregon's forest practices laws restrict timber harvesting, road building and the use of chemicals near streams and other water bodies. According to the Oregon Water Quality Index, among all land uses, the highest water quality occurs in forested watersheds, including those actively managed for timber production. How are drinking water sources and fish protected in Oregon’s forests? 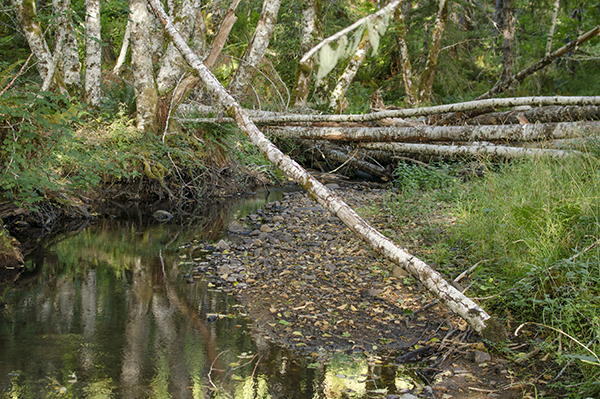 Oregon law requires leaving buffers of trees and vegetation around streams, rivers, lakes and wetlands that are sources of drinking water or where fish live. Within these buffers, timber harvesting is either limited or restricted. These buffers, left on both sides of a stream, are between 50 and 100 feet wide, depending on the width of the stream. The use of forest herbicides is also restricted near water supplies. Over the past few decades, logging practices have been revolutionized in ways that prevent disrupting, exposing or compacting forest soil. Skyline logging systems, for instance, suspend logs above the ground when they’re moved from where they’re cut to where they’ll be loaded on trucks. Forest roads can be a major source of muddy water in a forest. A properly designed, built and maintained forest road diverts rainwater from the road onto the forest floor, where it can be absorbed and filtered before flowing into a stream. Well-engineered and properly located forest roads and stream crossings reduce effects on water quality. Roads that do not meet current standards may not be used during heavy rain. It is illegal to spray herbicides in or near streams, where they might impact vegetation or insects, which are food sources for fish. Aircraft must not spray within 60 feet of fish and domestic-use streams. Ground spraying requires staying at least 10 feet away. It is illegal to apply herbicides when weather conditions would cause the product to drift off-target. Join Mike Cloughesy and Nicole Strong as they describe how forest operators are protecting the quality of Oregon’s drinking water. Modern logging techniques, well-engineered roads and protective vegetative buffers around streams keep our forest streams cool and clear. In response to the listings of salmon species under the federal Endangered Species Act, Oregon lawmakers joined landowners in 1997 to create the Oregon Plan for Salmon and Watersheds. The Oregon Plan seeks to restore salmon runs, improve water quality and achieve healthy watersheds through the joint efforts of government, landowners and citizen volunteers. The effort is unique among state protection plans for its emphasis on landowners voluntarily exceeding regulations, and for its engagement of communities in restoring their watersheds. It is part of a three-pronged effort to protect water and fish habitat in Oregon that includes the state’s forest-practices and land-use laws, which work to keep forestland from being converted to other uses that are less compatible with quality fish habitat. Forest landowners, together with the state of Oregon, have voluntarily restored fish habitat on almost 7,500 miles of streams in the last 20 years.